The following graphic illustrates the commonly used template building blocks and their (default) position. Using custom CSS (see CSS Rules), you can adjust the positioning, layout, etc. according to your needs. Page Header Is displayed at the top of each page (except for the first one) and can be used to display a page counter. 2 Header Defines the header area printed on top of the first page of an invoice. Commonly used for including a company logo, contact information and other invoice details, like a customer account number. 3 Sender Address Defines an area for printing the sender's address, usually positioned above the recipient's address. 4 Recipient Address Defines the area for printing the recipient's address. Using placeholders, you specify the address information to be printed. Billing Address Defines an area for printing the billing address, which is printed if it differs from the recipient's address. 5 Display Type Specifies the type of the invoice to be printed to the PDF, like Invoice, Credit Memo, Reminder. Info Right Define areas for printing a page counter, the invoice number and the invoice date above the actual invoice text. 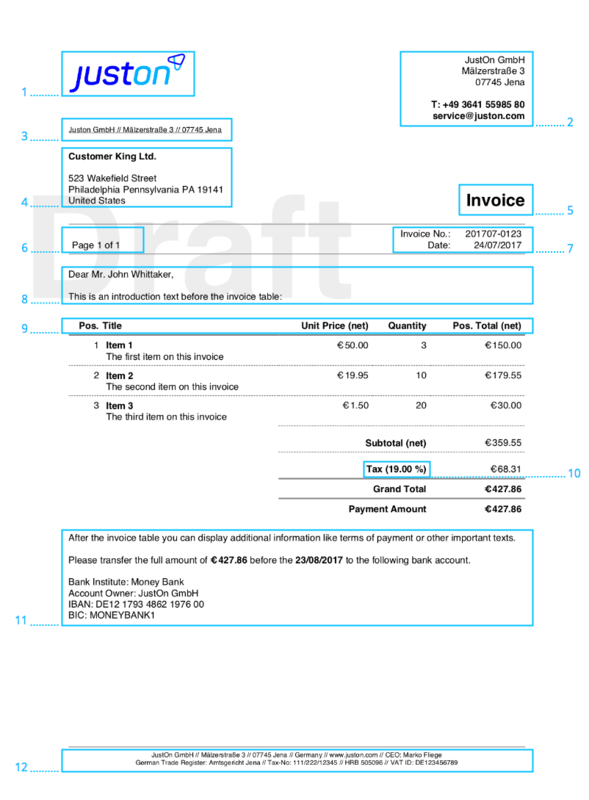 8 Text 1 Text to be rendered above the invoice line item table, can be used, for example, to edit a letter-like text introducing the invoice that follows. 9 Table Columns Defines the columns for the invoice line item table. The definition must be a list of invoice line item field names separated by semicolons. A column can display the concatenated values of multiple item fields. To concatenate fields, use the plus sign. Subtotal (net) Label Defines the display of the subtotal (net) information, which is rendered as part of the invoice calculation below invoice line item table. Can contain placeholders, like Subtotal [ProductGroup]. If empty, defaults to the custom label SubTotalNet. Subtotal (gross) Label Defines the display of the subtotal (gross) information, which is rendered as part of the invoice calculation below invoice line item table. Can contain placeholders, like Subtotal [ProductGroup] (gross). If empty, defaults to the custom label SubTotalGross. Subtotal Without Discount (net) Label When showing the order discount, defines the display of the subtotal (net) information without discount, which is rendered as part of the invoice calculation below invoice line item table. Can contain placeholders, like Subtotal [ProductGroup] (net). If empty, defaults to the custom label SubTotalNetNoDiscount. Subtotal Discounted (net) Label When showing the order discount, defines the display of the discounted subtotal (net) information, which is rendered as part of the invoice calculation below invoice line item table. Can contain placeholders, like Subtotal discounted [ProductGroup] (net). If empty, defaults to the custom label SubTotalNetDiscounted. Order Discount Label When showing the order discount, defines the display of the order discount information, which is rendered as part of the invoice calculation below invoice line item table. Can contain placeholders, like Discount [ProductGroup] ([OrderDiscount]). If empty, defaults to the custom label SubTotalAEDiscount. 10 Tax Label Defines the display of the tax rate information, which is rendered as part of the invoice calculation below invoice line item table. The placeholder [TaxRate] is replaced by the actual value, like 7%. 11 Text 2 Text to be rendered below the invoice line item table, can be used, for example, to add payment terms. Text 3 Additional text to be rendered below the Text 2 block. 12 Footer Defines an area for a running footer printed on the bottom of each page of the invoice. May contain information such as the sender's address details, bank account details, and other contact information, like phone numbers, email addresses, links to web sites, etc. The template includes fields that are involved in a number of specific use cases, which are explained in their corresponding documentation. The template detail/template edit view may show the fields in a different display order, grouped by sections. If required, you can adjust the page display according to your needs (see Managing Page Layouts). Email Text PDF Name Specifies the name for the generated PDF file. It can contain placeholders, the default is [InvoiceDate]_[InvoiceNo]_[AccountName].pdf. Attach Files To Outgoing Email (checkbox) Controls whether attached files are included in any outgoing email. Email File Types Defines which file types will be attached to emails (comma separated list of file extensions). For example, pdf,csv sends all PDF and CSV files; if empty (default), all files files are attached except for transaction table HTMLs. Email Sender Defines an email sender address. Note that this address must be available as an organization-wide email address. Email Subject Defines the default email subject. Can include placeholders, like Invoice: [InvoiceNo] (default). Email Body Defines the plain text body for the email. Can include placeholders, and line breaks are considered. Make sure that the email text includes the placeholder [InvoiceLink] (up to JustOn 2.48) or [PaymentLink] (as of JustOn 2.49) for the recipients to be able to access the invoice or payment page. Email HTML Body Defines a rich HTML body text for the email. The editing area of this field includes an inline HTML editor. Email Body is ignored if there is content in Email HTML Body. If you send email with non-Latin data, like the Euro symbol, Hebrew, Chinese, Japanese, Russian, etc., set your email encoding to Unicode (UTF-8). For details, see Why do PDF files or emails contain garbage characters?. Placeholders are symbols for fields of Salesforce or JustOn objects (like address fields or payment data), which are to be replaced with actual values upon PDF rendering. JustOn provides a set of generic, built-in placeholders. These placeholders are defined in the software package. They cannot be modified nor be found in the custom setting Custom Placeholders. [InvoiceLink] Provides a link to the internal payment page (up to JustOn 2.48). [PaymentLink] Provides a link to the payment page of the JustOn Self-Service Extension (as of JustOn 2.49). [TaxRate] Can only be used in the tax label field at the template. As opposed to the built-in placeholders, custom placeholders can be modified. If you need additional placeholders for any other custom fields you may have defined, like, for example, the Account object, you can create new custom placeholders. During the installation, JustOn creates placeholders for all standard and custom fields of JustOn objects. These placeholders are referred to as default placeholders. JustOn can add new placeholders with every software update. JustOn implements custom placeholders using the custom setting Custom Placeholders. Name Specifies the name of the placeholder, which must be unique. Decimal Places Specifies the number of decimal places to be printed when rendered as numerical value. Defaults to 2 when left blank. Fallback if fields empty Specifies a comma-separated list of fields that must all be empty in order to trigger the fallback mechanism. This prevents mixing up of address data if, for example, only single fields of an address (like the street name) are empty. When configured properly, the fallback address is only used when all fields of the primary address are empty. Fallback if field missing If checked, triggers the fallback mechanism if the primary field is empty. Fallback rule Specifies the name of the placeholder that is used when the fallback mechanism is triggered by one of the conditions defined above. Field Specifies the name of the field that is retrieved from the source object. Custom fields on standard objects must be whitelisted in order to be available as custom placeholders. Render as Defines the rendering mode for the placeholder, like TEXT, DATE, MONTH, PERCENT, AMOUNT, AMOUNTISO, NUMBER, DECIMALABS, FIELDLABEL, PLAIN, LOCALAMOUNT, LOCALAMOUNTISO. Source Specifies the name of the source object from which the actual value is retrieved. For an overview of custom placeholders, navigate to Custom Placeholders > Manage in Setup. This displays the list of custom placeholders that you can use in templates. Click Manage in the row of Custom Placeholders. The mandatory information include the name, field, render as and source. This creates the new custom placeholder, which can then be used immediately as [placeholdername]. You can modify the way custom placeholders are rendered. For date placeholders, you can apply an individual format to overwrite the data format as defined with the template (see Adjusting Invoice Formatting). To this end, add the intended format as a parameter to the placeholder, like [InvoiceDate:MM/yy]. For details about supported formats, refer to the Simple Date Format syntax in the Java Documentation. For text placeholders, you can apply filters to modify the rendered output. The syntax is [placeholder|filter]. You can combine filters, like [AccountName|cut:20|linebreak]. Under certain circumstances, you may need to disable placeholders on invoice line items. If, for example, you retrieve the product title or description from an external system, they may contain text with square brackets that JustOn must not consider as placeholder mark but as actual brackets. Ignore Placeholders false Disables the evaluation of placeholders when finalizing invoices and rendering the PDF. You can use the ON field mechanism, Salesforce processes or other automation tools to have the Ignore Placeholders field set automatically when generating invoices and invoice line items. The layout, styling, positioning of the template building blocks is controlled using CSS rules. JustOn defines a default set of CSS rules, which are part of the Visualforce page DefaultInvoiceStructure. To view it, change to Setup and navigate to Custom Code > Visualforce Pages > DefaultInvoiceStructure > Preview > CSS. font attributes of text elements like text size, color, etc. The following table lists the div containers that include the commonly used building blocks as listed in PDF Contents. For information about identifying the actual CSS class to modify, refer to Accessing Template Debug Mode.